Similar to this is the paper wallets you can buy online, pre-charged with a given amount. You should not buy these from eBay. In fact, whenever you are dealing with paper wallets, you are trusting the vendor not to keep a copy of the key to reclaim the funds at a later time. A safer variation comes in the form of the bitcoin ATMs springing up all over the world. These typically accept banknotes and print out a ‘receipt’ containing a bitcoin address and private key, and usually a QR code to allow you to redeem it with a smartphone app. If you want to buy at market rates, one of the big exchanges is the only viable way to go. This website offers an excellent guide to the various Bitcoin Exchanges.The Mt Gox fiasco taught us not to keep bitcoins on an exchange for longer than necessary, and to be wary about security. The good news is that after Gox ‘lost’ 850,000 bitcoins and went bankrupt, the other significant exchanges focused on increasing their reliability, transparency, and security. The result is that most transfers are safer now than they have ever been. 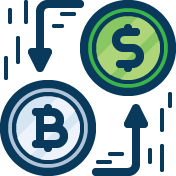 Nevertheless, you should have a reliable storage option ready to go – either a hot wallet (Blockchain.info provides an excellent service for free) or a cold one, whether paper or in another form. Significant exchanges include Bitstamp and Coinbase. (BTC-e, also one of the largest exchanges by volume, has remained intentionally anonymous – which will not inspire confidence in a post-Gox landscape.) There are plenty of others, but they offer a similar service, and it’s worth bearing in mind that smaller exchanges, with lower volumes, are less competitive – the bid/ask spread typically higher when liquidity is more moderate. These make trading bitcoins as easy as possible, though you will still need to jump through some hoops. Registering is straightforward. However, to deposit funds, you will need to have your account verified by sending in scans of (generally) two forms of identification. This, again, is straightforward, but it can be a hassle and verification can take anything from a day to a fortnight under normal circumstances. This is necessary to comply with anti-money laundering laws: the exchanges have to be able to prove they know where the funds are coming from.